Can you fund a mortgage deposit using a personal loan? A few months ago I wrote a post discussing different ways to fund your mortgage deposit, beyond the recommended method of saving up the money, of course. In that post I was really tempted to talk about personal loans. In the end I decided not to because if I’m being honest, I don’t really think that taking out a personal loan to fund a mortgage deposit is the best idea. As the weeks have gone on since writing the post however, I have been feeling as though I should at least have given this option a mention, as it is a legitimate way to raise the money for a deposit on your first home, even if it wouldn’t be my first choice method. Can you fund a mortgage deposit with a personal loan? To start off, let’s try and answer the question of whether you can even fund a mortgage deposit with a personal loan? The answer is yes, you can. That’s the simple answer though, in reality it’s a little more complex than this. Firstly you will need to spend a little time finding out which mortgage lenders will allow personal loans as a deposit source. This may take a little time and personally I would consider talking with a mortgage broker* about this, as they will likely have much more accurate information about the true state of play with the many different lenders that are out there. Many lenders won’t accept personal loans as a deposit source but some will, so it’s worth getting some solid professional free mortgage advice. Apart from the fact that not every lender will accept personal loans as a deposit source, there are other complications that could arise if you want to fund your mortgage deposit using a personal loan. The main complication is linked to affordability checks. When you take out a loan to fund a mortgage deposit, this loan will then show up on your credit report. This will mean that it will more than likely be picked up by lenders when they come to credit check you at the point of your mortgage application. This will effectively reduce the amount you are able to borrow, as your monthly outgoings and overall debt load will have increased. This doesn’t mean that it will ruin your chances of getting a mortgage loan completely, but it may have an impact. Then we have the question of whether a personal loan provider will be willing to lend you the money if they know that you are going to be using it to fund some other form of borrowing. Some personal loan providers may not like this and their criteria may even restrict it. If you do find that this is the case then it may be worth trying a peer-to-peer lender like Zopa to see if they would be happy to lend for this purpose. Should you fund a mortgage deposit with a personal loan? Then we come to the question of whether you should use a personal loan to raise a mortgage deposit? The question I would ask is ‘why are you thinking of doing this’? Is it because you can’t afford to save up the money? 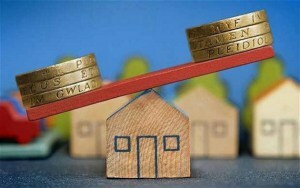 If this is the case, then it would be wise to ask yourself whether taking out a loan to fund your mortgage deposit will place your finances under even greater strain or pressure once you have bought your house, have moved in and will likely want to spend a little money improving the property or transforming it to your aesthetic tastes. If it would, then perhaps this isn’t the right option for you. If after doing the maths however you feel as though getting a loan for your mortgage deposit could make sense, then this is your call. We can see then that while it is certainly possible to borrow money in the form of a personal loan to fund a mortgage deposit, it may not be a straightforward process. It also might not be a wise financial move for you. If after giving it careful consideration however, you feel that this option could work for you, then at least you now know that it is possible and it will likely just be a case of finding the right lenders who are happy to accept a mortgage deposit from this source and who are also willing to grant you a personal loan to be used for this purpose. Mortgage Valuation Survey – What do they look for? One Response to Can you fund a mortgage deposit using a personal loan?